Works well as an accent for living and family rooms! Combine comfort and style with ease with this Your Zone Flokati Pillow. This beautiful addition to your home decor will allow you to add a bit of flair in many of your rooms, while also helping to add a luxurious layer of softness and warmth. With its style and versatility, you can use this Your Zone Flokati pillow on chairs, sofas, beds or anywhere else where you just want to relax and get comfy. 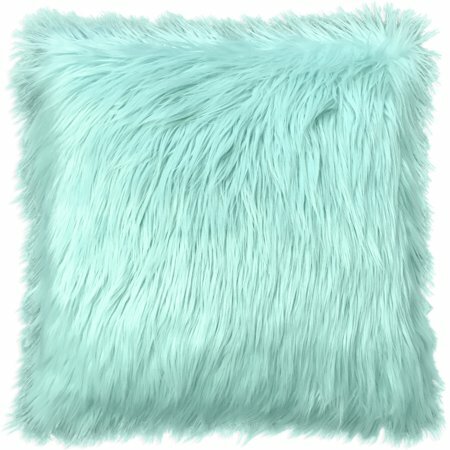 The decorative pillow is a made of a soft Flokati, and the faux fur provides the look of Mongolian fur decorative pillows. The Your Zone Blush Flokati Pillow is a quick way to add plenty of style and comfort to your home decor. The Your Zone Flokati Pillow is made up of 100% polyester material making it soft and comfortable to lay on. The decorative throw pillow comes in many different colors to match all your home d&eacute;cor needs. The Your Zone Flokati Pillow is the perfect 16” x 16” size making it easy to fit in areas for adding some d&eacute;cor to your home. The Your Zone Flokati Pillow is spot clean only for best care. Combine comfort and style with ease with this Your Zone Flokati Pillow. This beautiful addition to your home decor will allow you to add a bit of flair in many of your rooms, while also helping to add a luxurious layer of softness and warmth. With its style and versatility, you can use this Your Zone Flokati pillow on chairs, sofas, beds or anywhere else where you just want to relax and get comfy. 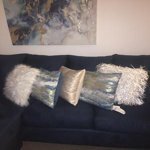 The decorative pillow is a made of a soft Flokati, and the faux fur provides the look of Mongolian fur decorative pillows. The Your Zone Blush Flokati Pillow is a quick way to add plenty of style and comfort to your home decor. The Your Zone Flokati Pillow is made up of 100% polyester material making it soft and comfortable to lay on. The decorative throw pillow comes in many different colors to match all your home décor needs. The Your Zone Flokati Pillow is the perfect 16” x 16” size making it easy to fit in areas for adding some décor to your home. The Your Zone Flokati Pillow is spot clean only for best care. I purchased two of these in the âsoft silverâ color to go on my bed with a dark gray comforter set. They look great. Just the right amount of contrast. The color is true to what you see online. One side is furry and the other side is a soft plush fabric. (See photo!) I want more of these in other colors now. This is beutiful pillow ! I actually wanted to use it for bathroom decoration on top of a stool I have so I took off some of the stuffing amd it looks so cozy and cute! Love it!!!! My oldest daughter purchased this pillow as a gift for her 12 year old sister who suffers from migraines. The pillow is extremely soft and comfortable. My little one loves cuddling into the fur when she is not feeling well. It is also plush enough to give her some cushion to rest on. It's like having a stuffed animal she can use as a pillow. I really like this pillow and would recommend it to others. Cute! The "white" is actually ivory with flecks of gold tinsel that I didn't care for much but it still looks great on my bed. The back is fleece and I flip it to that side when I lay on it as the fur is too much for my face so still functional! 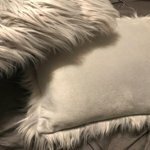 This pillow is a cheaper alternative to a more expensive "Faux Fur pillow." 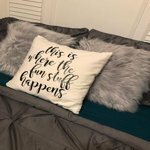 Cons- The pillow is small and looks more on the cheaper side than my more expensive throw pillow; Pros- It a cute knock-off pillow to compliment any room, if paired effectively! It seems to hold up pretty well and the price is AMAZING! I really wanted to like this pillow and at first I did. However, after about a month the fur gets clumpy and not nice looking. The pro of it is that the pillow is put together well. It might look clumpy, but it will last. Too bad it isn't a cover that can be cleaned.